Tokaido Highway, Shinagawa, Tokyo, woodblock reprint c. 1920. “Shingagawa was the post station at the end of the first of the fifty-three stages on the Tokaido, the East Sea Road, which connected Edo with Kyoto and Osaka … The East Sea Road was one of five great highways [Go-kai-do] that led out of Edo, and travelers to or from distant provinces, especially if they were feudal lords, were compelled to take whichever of these highways served their part of the country. “The East Sea Road was by far and away the busiest of the country’s highways, and Shinagawa, correspondingly, far busier than Senju, Itabashi, and Naito Shinjuku, the other three towns that served as first post station on their respective highways (the Oshu-kaido/Nikko-kaido, Nakasendo, and Koshu-kaido, respectively). “… Although such things can hardly be measured, the Tokaido was probably the busiest highway not only in Japan but in the whole of the world. “From Shinagawa to Kanagawa and beyond, both sides of the road were lined with shops. Each of the post stations had plenty of inns, and each inn had touts calling for customers and making a great clamor. 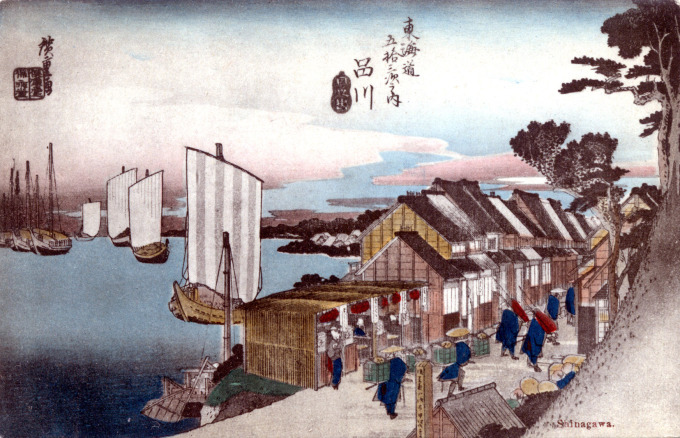 A c. 1920 postcard reproduction of the 19th century woodblock print by Hiroshige from the “53 Stations of the Tokaido” series. From the wiki: “The Tōkaidō [east sea road] was the most important of the Five Routes [go-kaido] of the Edo period, connecting Edo (modern-day Tokyo) to Kyoto. Unlike the inland and less heavily-travelled Nakasendō, the Tōkaidō travelled along the sea coast of eastern Honshū, hence the route’s name. “The standard method of travel was by foot, as wheeled carts were almost nonexistent and heavy cargo was usually sent by boat. Members of the higher class, however, traveled by kago. Women were forbidden to travel alone and had to be accompanied by men. Other restrictions were also put in place for travelers, but, while severe penalties existed for various travel regulations, most seemed not to be enforced.